For all those action lovers : The rush of adrenalin 'Avengers' is a power packed boost which will certainly assist you jumping off your seats.Make sure that you watch it only and only in a powerful multiplex preferably Wave or INOX (Lucknow) so that you feel the thunder, afterall sound is the only element which gets the action going. The storyline is so strong and compact that it'll not give you a single moment to leave for the popcorn and cold-drink , so I would suggest you purchase them before you enter the audi to double the fun. So here it goes - Nick Fury is a war-stricken mettlesome director of an extremely hideous and dynamic espionage agency called 'SHIELD'.While he joins a research project based on energy , Tesseract a source of energy opens a path through space from where Loki a forlorn God of 'the Norse' (which is considered to be a planet) escapes to earth.He is a megalomaniac and loves flauting his power , later in the movie we get to know that he happens to be the brother of ‘Thor’ – The Norse God of lightning and thunder. Loki starts spreading evil in the name of Tesseract and he has plans to rule the earth by this energy source.He wants to open the mysterious path once again and thereby summon his army to earth to wage a war. The entire pandemonium is all about this energy source - Tesseract .Nick has a project named ‘Avengers’ which he had kept intact since years, and it is time he believes in intiating the same. 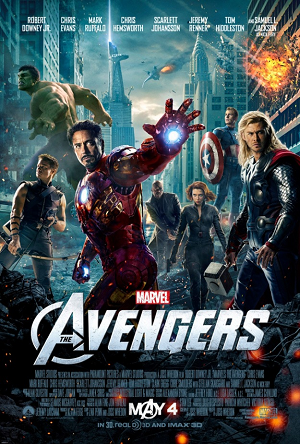 The ‘Avengers’ is a response team of super-heroes which will refrain the evil ‘Loki’ and will replace the Tesseract. Nick beckons - Tony Stark aka Iron Man, Steve Rogers who is Captain America (The first Avenger by Marvel), Bruce banner who is Hulk in disguise and Thor – The God to team up and assemble as the ‘Avengers’ to counteract Loki’s evil.Later on we see – agent Natasha Romanoff aka Black Widow and agent Clint Barton who plays ‘Hawkeye’ the impeccable archer joining the mission. The movie takes you up and down with action like a roller coaster, the first rush of adrenalin pumps in where we see Iron Man confronts Thor – the God, their clash is stunning and you’ll certainly enjoy the spark of their weapons where Thor proves his might using the deadly God’s Hammer and Stark (Iron Man) proves his technology to be at par with the former. This combat sequence is a treat to watch, I'm sure it’ll shake your brain and will apprise you of the level of action in the movie. Then we have the centre of attraction of the entire movie is Hulk – the monster.Every scene which has displayed the monster and his limitless brawn, evoked the audience to whistle and set the theatre in uproar.Hulk generally was never identified as a super-hero till date since the character evolves out of malfunctioned radioactive experiment followed by anger which turns him into a monster with immensive physical strength and throughout the last two movies we have seen his power and the destruction caused by his power but this time people related to the character as he has worked for a cause i.e. humanity and thereby earned a lot of respect. Hulk certainly deserves a double round of applause, the action scenes involving him are anticipated to be at their best however theu have turned out really cool.The scene where Hulk combats Thor is again mind-blowing, it takes you to a different horizon of action altogether. The director has worked a lot in helping you taste that action which certainly none of us have imagined before.Hulk also adds to the humour which he plays with Loki and Thor, it certainly moves your senses and refreshes you showing a different side of his character. Talking about Tony Stark – Iron Man, I personally believe that Robert Dawney Jr. has a powerful appearance and throughout the movie his humour has added to the flavor. He keeps the blend of action with humour very balanced and his acting is definitely mature. Stark’s appearance gives the audience a touch of advance technology and action unseen. Captain America on the contrary is a very serious character played by Chris Evans, the character belong to the era of World War and his shield along with his costume look lucrative and flashy.His defensive modes and flexibility has come out very well. Moreover he looks tall, smart and extremely fit.He speaks less and is patriotic to the core.In all the action sequences he has proved his mettle and he looks calm and pacified. His verbal spat with Stark is too good and it tickles the audience at times. Thor plays magic with his hammer and lightning, he looks dashing and masculine with his shaped biceps and gladiator costume. His camaraderie with Hulk, Iron Man and Captain America holds the movie for quite sometime, and moreover he looks powerful. Agent Natasha looks beautiful as ever and Hawkeye looks extremely fit and shaped up. These two characters have powerful appearances throughout and they throbe the viewers with their impeccable human skills. Natasha plays an experience and gorgeous spy and hawkeye plays a master archer with his innovated spears and arrows. The way Hawkeye opens his bow with a snap is appealing. The Avengers assemble and fight the odds, their unity holds the prime focus of the viewer. Above all the heart-wrenching action along with the smashing sound effects is an attractive feature and it leave not. All the stunts where the incredible Hulk is involved hold you on your couch, the hits, the smash and the thunderclap are all lollies to the eyes. The best thing about the movie is its consistency, none of the scene are seemingly repeatitive, all of them look fresh and critically designed. Those who do not love action and prefer watching romantic, they need not be dishearten, the movie has all the spices to support your interest. Don’t go by my review, its just a brief one, I have yet not discussed all the peppy elements of the movie, and those which I have discussed are not worth reading, they are worth watching…….and please do not buy or wait for the pirated version or the blue ray torrents.Movie’s real taste is in a multiplex and that too in 3d. Book your tickets now. Although I don’t think you would require booking as in India Hollywood movies hardly go for a housefull, but also I must tell you that when I went for the first day launch – the theatre was packed with all the age groups. The men-women ratio was quite balanced and to my astonishment some of them whistled and laughed. The movie certainly gave them such a dose that they could not resist. So don’t think, thinking is such a waste of time. Go and watch it. All the best happy watching ! I personaly wasn't that interested in the movie but after reading the review had a change of mind.The flow of ideas is so laudable sir.Loved the last bit. fantastic comments Mr Divya. really appreciable review by you.